Published on 18. 08. 2014 in comics and cartooning and commentary and criticism. Closed Tags: Frémok, Olivier Bramanti, Yvan Alagbé. This review is was originally published in Danish at Rackham in 2004 and is reprinted here as a supplement to the short essay Yvan Alagbé’s comics that I’ve just published over at The Comics Journal. The French-Belgian publishing structure Éditions Frémok, or FRMK for short, has now been in the game for ten years, initially separately, as Belgian Frémok and French Amok, and since 2002 together. They have managed one of the most consistent and challenging publishing programs in avant-garde comics. They have unerringly emphasized the boundary-breaking, the experimental, and often fine arts-oriented comics by some of the most innovative creators in Europe, people such as Thierry van Hasselt, Olivier Marboeuf, Dennis & Olivier Deprez, Stefano Ricci, Silvestre, Kamel Khélif, Vincent Fortemps, Michael Matthys, Dominique Goblet, Martin tom Dieck, Nabile Farès, Aristophane, and the Dane Søren Mosdal. Their publications are unequivocally high art and as such expose themselves to criticism on two flanks. One is the risk of pretentiousness and postulated profundity, the other is the inevitable comparisons with other forms of visual art, comparisons which tend to put this kind of sequential painting to a disadvantage. Unsurprisingly, FRMK’s publication history is one of precarious and not always successfully negotiating these difficulties, but the fact that they persist is entirely to their credit. It is refreshing to see somebody uncompromisingly asserting their belief in the potential of the medium to fathom the wide expressive range that has traditionally been the domain of other media. And they have published a number of great, if sometimes also flawed, comics. Counting among these is the expansively conceived and highly ambitious Qui a connu le feu / Who Has Known Fire (the comic is lettered in both French and rather poor English). And FRMK’s usually high production value is evident: 56-page reinforced hardcover, printed on heavy semi-coated cream-colored stock without halftone dots, with captions coated in matte gold. 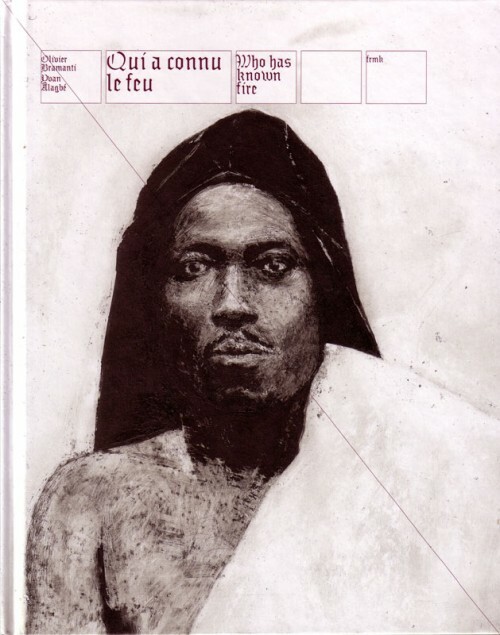 It is written by FRMK’s French publisher Yvan Alagbé, who here a reaches a culmination of the ongoing investigation of colonialism and its legacy that he previously treated in the comics Les Nègres jaunes (1994) and Dyaa (1997). 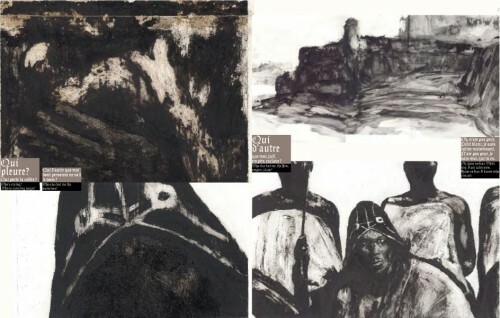 The art, loosely wrought in brush and ink, is by Olivier Bramanti, who continues his examination of the nature of conflict and war, which he has previously engaged with in his work on the wars in Bosnia and Kosovo, Le Pont de l’Ange (1999) and Le Chemin des Merles (2001). The premise here is a hypothetical dialogue between colonialist and colonized. The former is personified in the Portuguese King Sebastian I (1554–1578), who disappeared in 1578 on a campaign in Marocco and thereby exposed his country to annexation from Spain, and has since been regarded as a savior who will return to reclaim his kingdom when the time is right. The latter is represented by Béhanzin, king of Dahomey (present-day Benin), who fought passionately but in vain against the French colonizers in the 1890s and ended up exiled to Algeria. Alagbé has sampled a range of historical sources, including Béhanzin’s own, documented words to his people and a couple of the great Portuguese poets, Luis vaz de Camoes and Fernando Pessoa, but he includes a lengthy passage from a classical scholarly analyses of colonized India as well. The result is a synthesis exploring the meeting of the self in the Other. Sebastian and Béhanzin are opposites, but share similar destinies. They were both regarded by their people as Messiah-like figures, and they both invoked the same Christian God in their endeavors. At the same time, however, they occupy opposing sides in the struggle between exploiter and exploited, colonizer and colonized. Béhanzin’s monologue, thus, becomes an extended double entendre in which Sebastian is addressed as “petit blanc”—‘little white man’—but is simultaneously the white god he worships, outside of whom only the devil, the Black, exists. The devil is described as an tool in the hands of the white man, from whom the black man’s passion is the only salvation. The final aspiration, naturally, is the true union that one senses and fears is impossible. 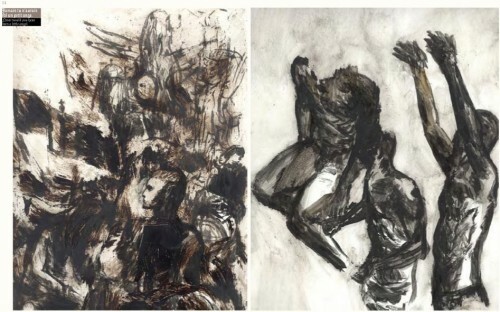 Bramanti’s pictures anchor the lyrical text in expressive, single images, which exists in dialogue with the words and gradually take on the feeling of a sequence, if not a narrative, held together by cultural, religious and colonialist symbols and representations of the human body and—especially—face. The latter is quickly established as the basic motif of the book, and the reader is treated to a veritable catalogue of primarily black faces, painted at various stages of definition and clarity—from the loosely defined to the detailed to regular portraits. This has the rather simple effect of diminishing the feeling of the unknown, the Other, in the mind of the reader. Once again, we are dealing with an evolving ambiguity: one the one hand, the black person and the black body are objectified, while on the other the pictures assert a special, African exceptionalism to which the colonialist gaze is denied access. The result is a symbolic play of words and images that empower this ambitious, and borderline overbearing, work’s compelling utopian vision of union.